Mumsie: what would you like us to get you for your 18th Birthday present? Wendy: What if I buy the bike and you can give me a full set of leather gear and a helmet for my 18th? Wendy: What can I have? Wendy: If that’s what I’m allowed, I’ll take it… … can I pawn it for money towards a motorcycle? Mum and Dad rarely rowed. Later that year they rowed about my getting a motorbike. Dad sided with me, placating mumsie with a promise to make sure that I looked after the bike properly. The morning before Dad took this photograph he carried a comfy chair into the garage while I laid out the large tent groundsheet on the garage floor between my bike and his comfy chair. Dad opened the Haynes manual. Gradually I deconstructed the engine and lay each piece out in neat chronological order on the groundsheet. When the engine was in pieces we took a break to clean up and eat Sunday lunch. Then, slowly, peace by piece, I rebuilt the engine. When I got confused, Dad showed me the relevant Haynes manual picture and pushed me to make a decision. He helped listen to the sound quality when adjusting the timer. I felt so proud of myself once I’d finished. Dad let me wear my favourite of his jumpers for this celebratory photograph. The bike lasted just over a year before I sold it on for a profit. This scribble was published on Friday, June 29th, 2012. You can follow any banter on this scribble with the RSS 2.0 feed. You can share your inspired musings after typing the anti spam word near the bottom of the page. But no Pinging because its too naughty. Wait…you got the motorcycle AND the ring? You lucky, lucky girl! Love the photo of you on the Honda motorbike and I love the jumper too! (Two words here that most Americans wouldn’t know…”jumper” means sweater and “rowed” means argued. Hi Kay, I bought the bike and the protective riding clothing with a loan dad gave me. I paid him back with interest within the year. Mum and dad gave me the ring as an 18th Birthday present. Keep the cross-Atlantic translations coming! Just (re?) discovered your great blog. 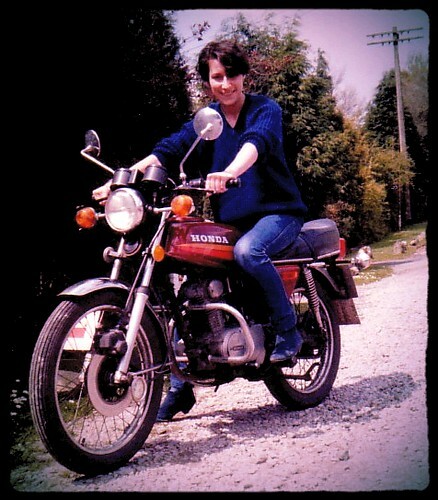 I’d completely forgotten my resentment when my brother, at eighteen, was allowed a motorbike whereas I, five years earlier, had been non-negotiably refused – thanks for reminding me. I’ll bring it up with him when I see him next week. Oh, and thanks also for reminding me of some of those lovely walks.